Carolina House is a residential facility dedicated to providing quality care for the treatment of eating disorders and accompanying issues, such as anxiety and depression. Clients at the Durham campus live in a home-like environment where they can get away from day-to-day stressors and, through a treatment approach that encourages self-exploration, replace self-destructive behaviors with a healthy, new way of living. 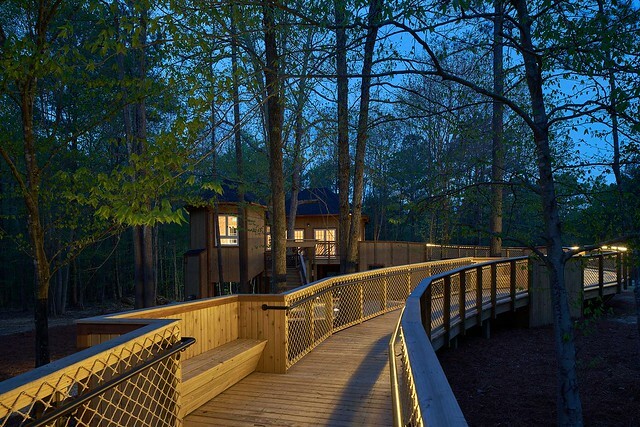 Nestled not just among the trees, but actually in one, the recently completed treehouse provides the quintessential setting for clients' self-exploration. The treehouse will host a variety of programs, from yoga to tai chi, designed to help patients integrate mind and body with the ultimate goal of self-acceptance. The 569 square-foot healing space includes a large yoga studio plus a separate therapy room. Everything about the treehouse elicits a sense of calm, from its verdant and lush natural setting to the deck shaded by the leafy canopy of its host. A serpentine entry ramp meanders through the woods in a gradual, ADA-compliant ascent to the yoga studio. Neatly concealed under the railing, LED lights provide an almost ethereal illumination to guide guests up the ramp at night. Building materials were selected to convey a sense of warmth. Almost entirely constructed of wood, the treehouse is perfectly suited to its environment. A live-edge countertop is the ideal complement to the interior space. Large windows let the sun shine in and make clients at one with nature. Proving, however, that form follows function, wood-paneled inserts easily slide into the windows to create ample wall space required for several of the activities that take place in the studio. The design was adapted so that materials, such as the wood and wood finishes, could be sourced locally. The treehouse is not wired for phones or the Internet, ensuring that guests truly unplug when they visit. The space is not totally without modern conveniences, however. A restroom was a county requirement that provided an interesting challenge, both to hide pipes and ensure they wouldn't freeze in the winter. In fact, all evidence of electrical, plumbing, heating and cooling is hidden, maintaining a true getaway ambiance. Staff members at Carolina House believe the new space will provide the ultimate healing environment where clients can escape, catch their breath, and find peace within themselves.